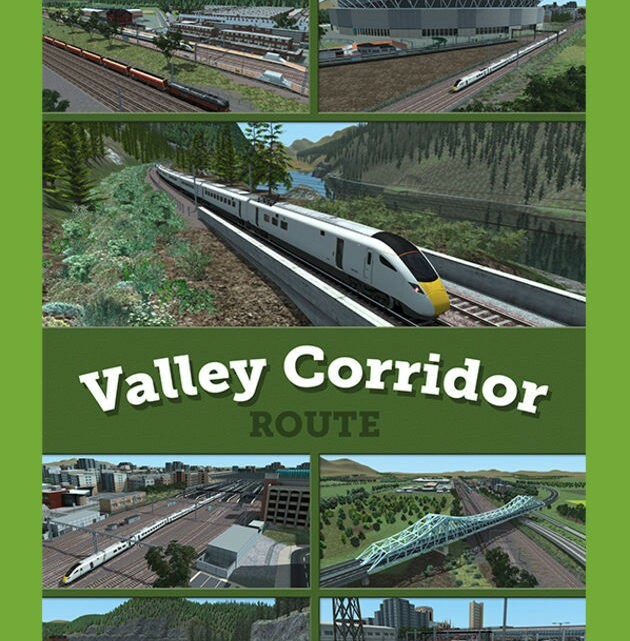 You can download the Valley Corridor Route manual if you’d like to find out more about the route! Sixteen stations are included in Valley Corridor Route. Situated at the tip of the northern part of the route, North Central is a somewhat spread-out and sprawling city located on an open plain but surrounded by hills in the distance. This small city combines elements of its older origins combined with newer architecture. The large centrally located station has a large all-glass canopy. The city is also served by a large freight yard where goods from the industries along the route are also delivered. This station of modern design serves the town of Newton and is mainly used as a commuter stop for the workers at the Newton power station and its supporting industries. Newton also has sidings which are primarily used for coal workings. Lowland Station is a fairly simple affair and serves the surrounding town that is mainly warehousing and light industrial to the east and the housing that supports those industries to the west of the tracks. The sports-mad residents even have their own sports stadium which is situated close to the station. It has its own freight sidings and is the end of the plateau area and the beginning of the more hilly and mountainous part of the route. Valley Pass station is a somewhat large station for such a small community, but it becomes busy when the staff from the local aggregate and freight yard need to get in and out of the valley. The small town it serves has its church next to the line. The station and town are located in the valley itself and are surrounded by steep rock formations and forest-covered hillsides. This station serves the small town of Summit Lake and its passenger numbers are swelled by the year-round influx of tourists to this highly attractive location. Access by road is through a mountain tunnel. The tourists can board the nearby boats for trips on the lake. High Pines gets its name from the towering pine trees that line the valley where the town is situated. It’s a thriving town that counts local farming, light industry and lumber amongst its businesses. Just to the south of town it has its own freight yard. The town also has its own small fuel refinery and set of holding tanks. High Pass is deep into the route. This small town is dominated by the modern multi-storey office building situated next to the station which is owned by The High Pass Insurance Company of Valley Corridor. This business was founded by Arthur J.T. Fudgebarrow who was born in the town and made his millions from offering insurance to the local farming, lumber, chocolatiers and porridge miners. You are now high up in the route. Green Valley station is on the opposite side of the spectacular valley canyon to the town itself. The two sides are joined by a road bridge. Road access to the town is via a unique spiral roadway in a tunnel. The deeply religious town community have erected a generously sized church. This is the last station southbound before the route’s famous double back loop section. This town is surrounded by mountain peaks and rests in a small flat are between two ranges. As normal on this route, it has its own freight yard which transports goods in and the raw materials mined from deep under the local mountains out. This is one of the larger towns outside of the two cities at either end of the line. Here the valley has widened out somewhat which has allowed the town to spread. It has its own freight yard, which sits beside the main through line and station. Sunny Valley has near-vertical rack faces on one side and more gentle mountains on the other. The alignment of the valley allows the sun to shine on the town, hence the name. Located next to a mountain, this small town is the base for the company that runs the rail system in the valley. It is located in the white teardrop-shaped building next to the station. Although Mountainside does not have a dedicated freight depot, lumber from the local area is collected here for onward transit. There are several fuel and gas storage tanks here and they are serviced by the railway. Here you can see the valley is getting wider and the mountains moving further away as we approach the southern end of the route. Widespace is a reasonably large town with many high-rise buildings. Work here is mainly clerical and light industry. Old Riverside is located next to the river that flows along the valley. The scenery here has opened up and the mountains are more like hills and have receded into the near distance. As usual, Old Riverside has freight sidings. Just south of the station there is a large near-90-degree change of path for the route. The rail entrance to the town of Marston from the north is dominated by the large road bridge which straddles the tracks and a road. Beyond that the town is fairly compact and sits on the start of the plateau which is characteristic of the southern end of the route. Driving south from the town, the route turns south by around 45 degrees, heading towards the southern terminus. This is the southern terminus of the route. The station has a large all-glass canopy but with some of the platforms outside this and exposed to the elements. Southern Central city sits on the southern plateau and is a large and bustling place. Located to the south of Northern Central City, this power station supplies electricity to the metropolis to its north. The facility takes its cooling water from the nearby lake on whose shores it is situated on. These are located just before you enter Valley Pass station. The freight yard is used mainly to transport aggregates along the route. This location is where the north- and south-bound track splits into two sections, each going round either side of the lake before rejoining at the lake’s ends. The reason for this split is geological. Just south of the town of Summit Lake is its freight depot and dock. These facilities mainly handle the lumber felled from the surrounding hills. High Pines freight depot has several sidings to assemble freight consists that move the lumber, farming and small local industry goods out of the valley. You are now high up in the route. Look out for the spectacular plunging valley and its river below. This is the unique section of the route where the track clings to the sides as it runs along and doubles back around two peaks before entering the town of High Mountain Plateau. Stand by for sweeping curves, a tunnel and spectacular views! A few clicks to the south of Mid Central is Mid Central Freight South. This is used for marshalling freight wagons before they move up north to the main freight depot at Mid Central. There are some light industrial units situated there as well. To the north, and just before the town of Sunny Valley itself, lies its freight yard. It mainly handles fuel and local goods. Just before the station you will see extensive freight sidings which serve this large town. Just to the north of Southern Central station is the Southern Central train depot. The trains that operate on the line are maintained here. Note: Some of these scenarios use default Train Simulator stock, but for certain scenarios to run correctly other additional locomotives are required. It’s 08:00. That’s means it’s rush hour and the commuters need to get to work on time. Drive from Southern Central to Northern Central non-stop. Drive an early morning limited stop down express to Southern Central. Drive a mid-morning local service from North Central to High Pines, stopping at all stations during an autumn rain storm. This evening’s shift is a simple all stations run south from High Pines. By the way, your booked loco failed… so better grab another one, Driver! Drive an early afternoon train of sports VIPs from Southern Central Stadium to North Central. Go and collect a van train and run it south to High Pines, then return north from Summit Lake with a rake of tanker wagons. Finish by disposing the loco on depot. Full loco prep and disposal are required for this scenario. Go and collect some vans from Southern Central Freight Yard, take them to Marston and return with a container train to the docks. Drive an early evening commuter train from Southern Central to Widespace, calling at all stations, but first drive the ECS! Starting in North Central Sidings, work the first down Morning Express to Southern Central, stopping only at Mid-Central on a stormy winter’s morning. Drive a single Class 90 from Southern Central docks to North Central freight yard, dropping off and picking up en route to Mid Central, then a final non-stop run to North Central on this nice summer day. Drive a late afternoon one-stop Express Service from Southern Central to North Central Station.